Today, I am featuring an upcoming military / science fiction novel in my book spotlight. 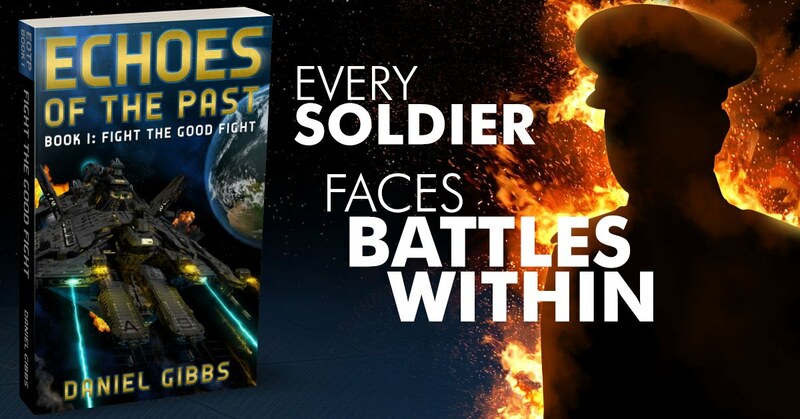 Check out Echoes of the Past, the first book in Daniel Gibbs', Fight the Good Fight series, set for release in May! A republic under attack. A reluctant soldier. An all-out fight for the galaxy’s soul. David Cohen prays he’ll live to see the other side of his first deployment. His people thought they had left war behind when they fled Earth centuries ago. Time, though, has not dulled the hatred and intolerance of their erstwhile oppressors. To defend his homeland’s freedom, David abandons his dream of becoming a rabbi for the battlefield… and discovers a side of himself he is not sure he can live with. David's focus is clear when the bullets are flying. In the long hours after, he must reckon with the toll that blood and blame bring upon his mind. Can he square the tenets of his faith against his responsibility to crew and country? Nothing has prepared him to make decisions that could cause ruin or an end to generations of conflict... except for trust in God, himself, and those who serve under him. If David Cohen survives it all, who will he be? Ever since watching Star Wars: The Empire Strikes Back at the age of five, with his father, Daniel has loved science fiction. Reading hundreds of sci-fi novels, during his teenage years, Daniel came up with the EOTP (Echoes of the Past) universe. Twenty years later, its finally becoming a reality!